NASA’s Cassini spacecraft scientists announce that a form of chemical energy that can feed life appears to exist on Saturn’s moon Enceladus, and Hubble researchers report additional evidence of plumes erupting from Jupiter’s moon Europa. “This is the closest we’ve come, so far, to identifying a place with some of the ingredients needed for a habitable environment,” said Thomas Zurbuchen of NASA’s Science Mission Directorate. Hydrogen gas could potentially provide a chemical energy source for life, and it’s pouring into the subsurface ocean of Enceladus from hydrothermal activity on the seafloor. Ample hydrogen means that microbes – if any exist there – could use it to obtain energy by combining the hydrogen with carbon dioxide dissolved in the water. This chemical reaction, known as “methanogenesis” because it produces methane as a byproduct, is at the root of the tree of life on Earth, and could even have been critical to the origin of life on our planet (see deep-ocean life that’s billions of years old). Life as we know it requires three primary ingredients: liquid water, a source of energy for metabolism, and the right chemical ingredients - primarily carbon, hydrogen, nitrogen, oxygen, phosphorus, and sulfur. 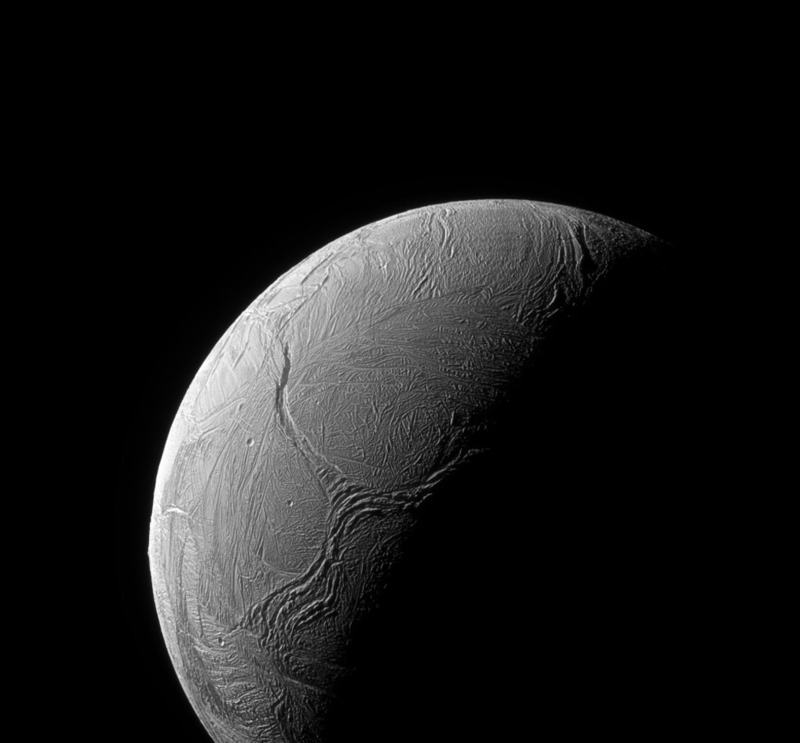 With this finding, Cassini shows that Enceladus – a small, icy moon a billion miles farther from the Sun than Earth – has nearly all of these ingredients for habitability. Cassini has not yet proven that phosphorus and sulfur are present in the ocean, but scientists suspect them to be, because the rocky core of Enceladus is thought to be chemically similar to other bodies that contain these elements. 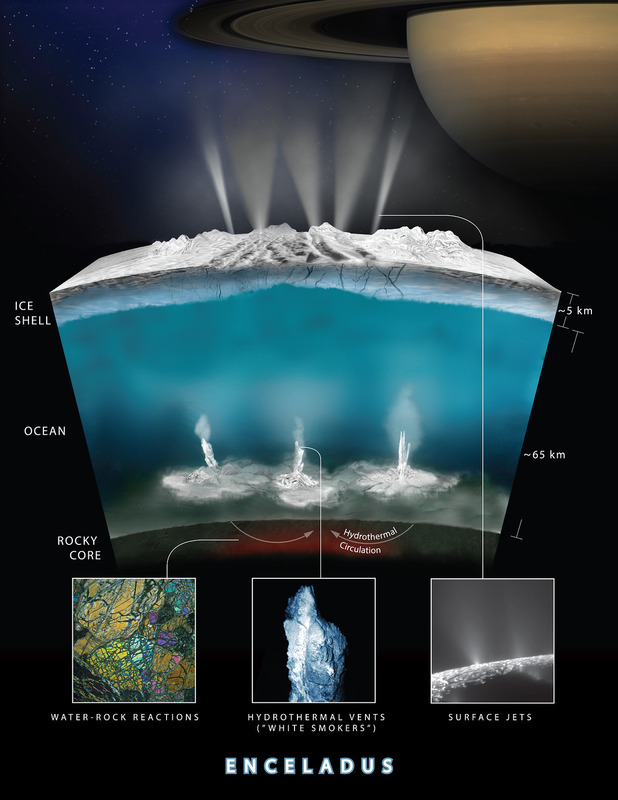 “Confirmation that the chemical energy for life exists within the ocean of a small moon of Saturn is an important milestone in our search for habitable worlds beyond Earth,” said Linda Spilker, Cassini project scientist at JPL).